For the best combination of quality and price, it is hard to beat AlienBees studio lights. I’ve been using AlienBees in my studio (and on location) for 7 years, and like so many other photographers, I’ve been singing their praises. It would be hard to find the same quality for less money. There are less expensive lights out there, but at a big drop in quality. There are high end, superb quality studio lights for a lot more money. AlienBees are right at the sweet spot of high quality at a very good price. Alien Bees are designed, manufactured and sold by Paul C. Buff who also makes the much praised White Lightning professional lights, and more recently the high end Einstein lights. All lights are sold directly from the manufacturer. Customer service is superb. There are three AlienBees models, the B400 for $224.95, the B800 (twice the output of the B400) for $279.95, and the B1600 (twice the output of the B800) for $359.95. They come in several colors, so I color code mine by power output. You can learn more and buy them here. I rarely have the B800 lights more than 10 feet from my subject (usually bounced out of an umbrella). With my camera set to ISO 100 and a lens aperture often set to f/8 or f/11) the B800s are rarely set higher than 1/2 power so they have all the power I need and then some. 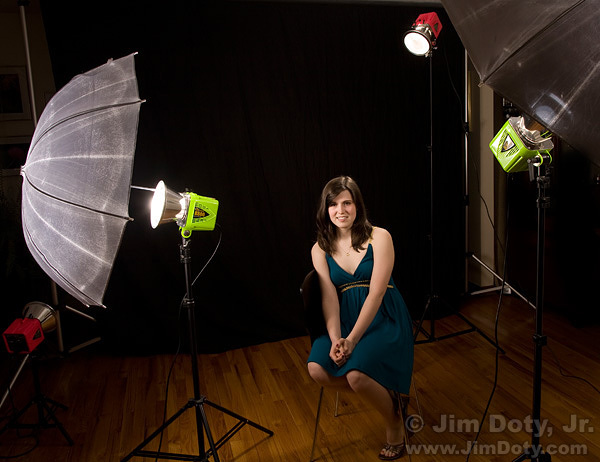 For a small studio, B400 or B800 lights are all the power most photographers would need. I recommend one of the packages. The Beginner Bee package for $372.86 includes one B800 studio light, 10 foot light stand, 51 inch PLM umbrella, a case for the light, and a 15 foot sync cord to go between the light and the camera. One or two of these packages and a large homemade reflector (4′ x 6′ cardboard painted white would work) would get you off to a very nice nice start. I’ve done a lot of portraits with just one or two lights. Add more lights as you need and can afford them. AlienBees have a built in optical slave so I trigger them with a shoe mounted flash set to 1/128 manual power (and pointed away from my subject), but you can fire them with the included sync cord, or a variety of remotes. If you are looking to buy your first studio lights, I highly recommend AlienBees. If you ever outgrow your AlienBees, you can always move up to the White Lightning or Einstein lights. This entry was posted in Flash, General, Photo Gear by Jim. Bookmark the permalink.